Poodle puppies for sale, not just beauty, but brains too! Are you ready to get a poodle pup? 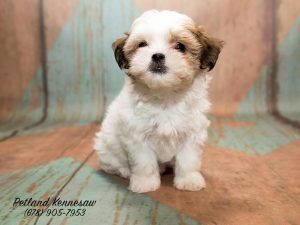 Before you jump on the first poodle puppies for sale ad you see, get to know a poodle puppy first. This dog is considered to be one of the most beautiful breeds, but at the same time, they are a breed that is highly intelligent. Getting a new puppy, especially one as wonderful as a Poodle, may just be one of the best decisions that you will ever make! Poodles have the perfect look from head to toe, but do you know that they were not just meant to be show dogs? Poodles were used as hunting dogs and were built to retrieve small game. They can swim really well and have a great nose for hunting too! Poodles are hypoallergenic dogs and this means their fur is actually more similar to hair. This makes them very popular with people with allergies, as Poodles don’t have dander in their coats. They will need more grooming than other breeds, because their coats grown continuously and can become matted because of the curls! So regular grooming, stripping and brushing is a must. Poodles require very little repetition during training and will learn tricks really well. They are also very easy to train and housebreak, which makes them ideal for first time owners. Poodles are charming and were thought to be meant for royalty but in fact, they are just happy to be where their beloved families are. They love kids and have the energy to be very active with their families. They will also go well with other animals and pets inside your home. Poodles are extremely loyal and protective of their owners. They can growl and bark when there is an intruder and will do all they can to protect their family. We hope that our blog has helped you decide that a Poodle puppy might be right for your family! Here at Petland, we always want to match the right puppy with the right family and make sure everyone has exactly what they need to thrive! 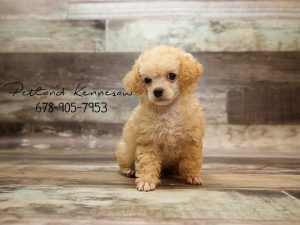 Want to check out all of our precious Poodle puppies for sale, just click here! Kid-Friendly Dog Breeds – Small Pups for Your Family! Good Afternoon, fellow animal lovers! Today, we want to talk dive a little bit deeper in talking about which small breeds of dogs fit well with families that have small children. With so many breeds out there to choose from, it can be a hard decision to make. But don’t worry, Petland is experienced with matching the right puppy with the right family! The only hard decision you’ll be making now is which of these pint-sized kid friendly dog breeds you’ll want to take home. Petland Kennesaw always has puppies, check out our available puppies page to see what we have in the store! Whether it’s lounging inside or being active outside, the Pug is a perfect match for families with young children. Even though they are considered a small breed, they are very hearty and can take some rough love! Because of their flat faces, they don’t do well in extreme temperatures, but as good apartment dogs, they won’t go crazy if inside for long periods of time. Sweet and loving to a fault, the Cavalier is the quintessential family dog. Even if they are being tugged on or trod on, this breed will always stand by its people! The Cavalier tends to not be a super active dog, so keep that in mind if your children are always on the go. Think more dress up and tea party time! Want to know more? We recently did a blog about the Cavalier King Charles Spaniel. The Poodle is an excellent choice for children or family members with allergies. As a hypoallergenic breed, the Poodle has hair as opposed to fur, severely cutting down on its dander and making it nearly non-shedding in comparison to other animals. However, because the hair is constantly growing, you will have to have the dog grooming periodically. Not many people haven’t heard of this breed! The Beagle has been a popular choice for families for many years because of its ability to be a loyal companion. Technically a small to medium-sized pooch, the Beagle is the largest on our list today. They are an especially great breed for several small children or kids that are very active, as the Beagle loves to run and play! This playful breed is one of our favorites to match with families! The Boston is loving, easy-to-train and does well with small children and other pets. As another hearty breed, the Boston can take some accidental licks and keep on ticking! They also tend to be quieter than some other small breeds. Same goes for the flat faced Boston as the Pug, limit outdoor time when the weather is too hot or cold, as it can make it harder for the Boston to breathe. As always, we encourage you to stick to a training protocol and supervise your new pup around the family. Even if they are kid friendly dog breeds, it is also very important that you teach your children to properly handle your new four-legged family member. Our Pet Counselors are always here to help make the transition to pet owner an easy one! Interested in finding out which kid friendly dog breeds we have in the store right now? Check out our available puppies page and speak to a Pet Counselor today! Puppy Training, 5 Important Things to Teach Them Right Away! Bringing home a new dog is a huge responsibility, no matter how old they are. One of the most important things you can do is ensuring your dog develops the behavioral, social, and physical skills needed to live a good life in our world! Puppy training can dramatically shape their personality and future. At Petland, we’re huge fans of using positive reinforcement when puppy training, using any of the scrumptious training treats we carry in our store. In order to make sure you’re setting your tail-wagger up for success, here’s a checklist of 5 crucial training and behavioral tips using dog treats to get you started. Sit, Stay, Come, Leave It: These are the golden puppy training commands that can make your life so much easier. “Sit” and “Stay” help teach your dog patience and these two commands come in handy when you know you’re dog is in a state of excitement. “Come” is one of those commands that will help you get their attention and serves as a good command when you need to distract your dog from what they’re doing. “Leave it” is best used for when they fixate on something, whether it’s destroying your shoe or trying to steal a treat off the streets. It’s important for your dog to love their bed/crate and know that that’s their space to claim. Having consistent spots in the house helps them feel secure since they have a natural instinct to den. Some dogs take to this more naturally while others need more coaxing, especially if it’s a crate or a bed placed in a spot of the house that’s not their favorite. The best way to get them to like their nook is to reward them with a treat when they are in the bed/crate. Soon enough they’ll begin to develop a positive association with the area and automatically go their designated spots! Dogs respond well to boundaries as long as they have been clearly defined. If your dog isn’t allowed to chew shoes, make sure you say a stern “No” and swap the shoe for one of their toys so they know what’s acceptable. Similarly if your dog isn’t allowed on the couch, gently push them off and when they stay down, reward them with a tasty treat and tons of praise. But make sure you stick to these rules. If you allow them on the couch sometimes and don’t at other times, it’ll confuse your dog and make it harder for them to know what’s ok and what’s not. Older adopted dogs, are usually house-broken but that doesn’t mean that they won’t have accidents while they try and get used to their new environment. The best way to train a puppy or dog to go potty in the right places is to deliberately walk to the spot when you know they need to go and when they do go reward them with praise and treats. By constantly reinforcing the behavior you’ll be able to get them on a steady routine where both you and the pup know when it’s time to go! 5. Teaching them to be ok with being home alone. If in your puppy training, you’ve gotten your pup to like their crate then leaving them home shouldn’t be too difficult. But for those of you who don’t crate, the best way to get your pup to not worry when you leave is to stagger the amount of time you’re gone and reinforce the good behavior with treats. First you can start by leaving them for 5 minutes. Come back and reward them if they don’t howl. Gradually increase the amount of time you’re gone. With some patience and time your dog will eventually learn that when you leave it doesn’t mean you’ll never come back. This a great way to also build trust between you and your dog. Once they start to trust they’ll be more at ease. Here at Petland, puppy training is a big part of our everyday lives. We specialize in helping customers with tips and tricks for all sorts of training concerns and questions. We also send each of our new puppies home with training sessions in our store with the option for in-home training as well from the training company we work with. Having a solid foundation of training, no matter how old your four-legged family member is, will not only make you happy, but your pet as well! We also stock everything you would need for successful training from treats to crates, correction collars and so much more! Swing by and let us help you today! 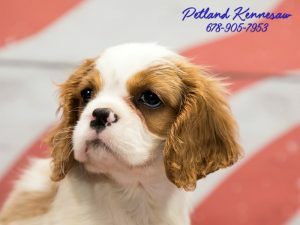 To find out more about puppy training at Petland Kennesaw click here! Cuddle Up Next to a Newfoundland Puppy for Sale this Holiday Season! Affectionately called “Newfies”, a Newfoundland puppy for sale might be just the pet your family needs! There’s one thing everyone knows about a Newfoundland: they’re big, really big. A full-grown male stands as high as 28 inches tall and weighs in at 130-150 pounds. But there is so much more to this breed than size, as any Newfie lover can tell you. Here at Petland, we are one of those rare stores that consistently has Newfoundland puppies for sale! 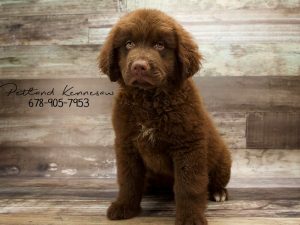 Want to see if we have the perfect Newfoundland puppy for sale for you, just click here for our available puppies page! What is it about a sweet-faced Newfie? Newfoundlands are renowned for their sweetness, gentleness, and devotion. In fact, that sweetness is a hallmark of the breed. They’re ideal family companions, with a special affinity toward children. Some people call them the “nanny dog.” Despite their enormous size, the Newfoundland is very adaptable and can do well in different environments, from smaller and urban to sprawling and remote. Obviously they can handle the cold, but watch out in hot weather, they can overheat easily. Now that would be a sight to see! Although they’re docile and are relatively placid, Newfoundlands do require regular exercise. You haven’t lived until you’ve seen a Newfie happily galloping in the yard or swimming in a lake! Their long, thick coats shed seasonally, and come in all black, chocolate, grey and landseer, which is black and white. They have an average life span of around 8-10 years. This is an ideal breed for new owners, as they train easily and are eager to please. They also get along very well with other pets in the household. Want to know more about the gentle giant we call the Newfoundland? Just give our knowledgeable Pet Counselors a call about your new Newfoundland puppy for sale today! A small dog in a big package (yes, that’s right!) The Great Dane is a step above the rest when it comes to pet companionship! Great Danes are known for casting a shadow over most other dogs—and small children. But their name is somewhat misleading, as they actually originate in Germany, not Denmark. At first, Danes were bred to hunt large game, but hunting became less popular and they had to change. Now Great Danes are bred to be gentle giants and the ultimate, if not just in size, family dog! 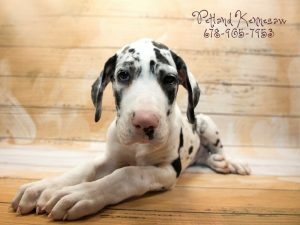 Want to check out all of Petland’s Great Dane puppies for sale? Just check out our available puppies page, right here! Great Danes grow incredibly fast, going from just a couple pounds at birth to nearly 100lbs in the first year alone! And they don’t stop there, Danes can top out at over 200lbs, although most stay in the 150lb range. They can also range in colors including mantle, different shades of harlequin and merle, fawn and brindle. It’s important to monitor food intake for the first several months of your Dane’s life because of their massive growth spurts. You also need to invest in a good brand of dog food, we feed and recommend Health Extension brad dog food in our locations. Despite their size, Danes are not very energetic and do well in small condos or apartments. Throw in the fact that they love adults, children and other animals, you’ve got one perfect pet! Besides the fact that Great Danes are notoriously goofy, this only endears their beloved owners to them all the more. You just have to watch out for leaving food on the counter tops, as that is eye level for a Dane! Want to earn more about what makes this colossal canine tick? Give us a call today for more information about all of our Great Dane puppies for sale! Petland Talks: Why Don’t You Have a Teddy Bear Puppy Yet?? Petland Kennesaw specializes in hybrid and designer breeds like our Teddy Bear puppies for sale! These energetic and lively dogs called Teddy Bears are excellent companions. Teddies are obtained by intentionally crossing a Shih Tzu with a Bichon Frise. They are fast gaining popularity as people love their little teddy bear faces, which is where their name comes from! 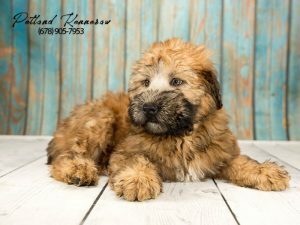 We have so many of our Teddy Bear puppy owners recommending this sweet breed to family and friends that it is by far one of our most popular designer mixes! Want to check out all of our beautiful Teddy Bear puppies for sale, just click on our available puppies page! Their small size, endearing features, and gentle temperaments made them perfect for showering children and adults alike with all the love and licks they can handle! They fit in with so many different types of families. They also are very adaptable and are just as happy in a small condo as they are on a sprawling farm. Teddies have low energy requirements, but are always up to play with their favorite humans! They are also one of the best small breeds for children as they will not snap at children that play a little too rough. Teddies have a non-shedding double coat that can range in color from all white to black, brown, cream and every color in-between. They do require grooming and brushing to keep their coats looking nice. They typically weigh 10-15lbs and have a life span of 12-14 years. Teddy Bears train easily and can live almost anywhere with all types of families. Do you think the Teddy Bear might be the perfect puppy for your family? Give us a call today for more information about our Teddy Bear puppies for sale today! Shiba Inu Puppies for Sale: You’ve Probably Never Heard of this Popular Breed! The Shiba Inu just might be the oldest (but still popular today!) dog breed on Earth! The Shiba Inu is the smallest of the original Japanese breeds and are actually the most genetically similar to wolves, suggesting that it’s among the oldest domesticated dog breeds. Despite that, the Shiba only just came to American in the 1950s and was officially recognized by the AKC in 1992. Since then, our Shiba Inu puppies for sale have been stealing the hearts of our customers. If you want to see pictures of our Shibas, just take a look at our available puppies page! Shiba Inus are very low-maintenance, for those who want less drama in their lives! Shibas have a self-cleaning coat that repels dirt, so they have minimal grooming requirements. They are well known for being very clean dogs, with the tendency to groom themselves like cats! They come in a few colors which include, red, black and tan and white. Shibas are so regal and beautiful, they have been dominating people’s instragram feeds for many years and show no slowing down! Don’t be worried that a Shiba Inu doesn’t want to be your friend! Shiba Inus can be a little standoffish around strangers, but are fiercely loyal to their families. They are adept at learning all kinds of tricks, but they need a firm, patient hand with training. They need some exercise daily, but do well in small, urban environments. A few walks daily, a rousing game of fetch (where you might be the one fetching) or learning a new trick is all the Shiba needs to burn off any excess energy. Did you love learning about the Shiba, but want to know if they might be the right fit for your family? 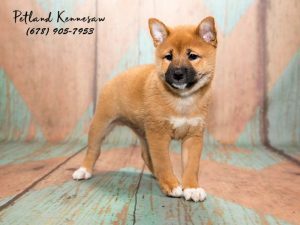 Just give our knowledgeable Pet Counselors a call today about our Shiba Inu puppies for sale! Have You Ever Thought About Adding a Miniature Australian Shepherd to Your Family? Our Miniature Australian Shepherd puppies might just be the companion of your dreams! Contrary to their names, the Australian Shepherd is not from Australia at all, but from a region near the Pyrenees Mountains! The breed was considered “perfected” in America and has been a beloved member of US households for many years. 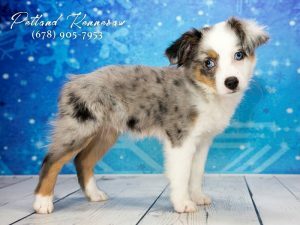 Both full size and Miniature Australian Shepherd puppies make great pets for those with active lifestyles, that’s why we always have them in our store, check them out here! Our beloved Aussies will steal your heart! Aussies were bred to be alert, intelligent, agile and adaptable to different terrains and climates. And while they started off as a herding breed, their ease of training has made them excellent services dogs, therapy dogs and, oddly enough, rodeo clowns! They are great for first time owners because they train very quickly and are eager to please their owners. They do need to have ample playtime throughout the day to keep their excess energy down. Usually a nice romp in the backyard or fetch session at the dog park will do just for the Mini Aussie! While the Mini Aussie is most notable for having blue eyes, they can also be green, hazel, brown or even a marbling of two different colors! The also come in a variety of coats, including chocolate, black, and red or blue merle. They weigh in at about 20-30lbs full grown. You do have to watch out for shedding seasons like Spring and Fall and we suggest routinely using a nice de-shedding brush. The Aussie is an energetic breed that needs time outside to run and play. They make a great pet for active families that have children and a big back yard! Interested in finding out more about the Miniature Australian Shepherd puppies we have in our store, just give us a call today! Our Soft Coated Wheaten Terriers for Sale Will Keep You Warm This Winter! Don’t know much about the Wheaten Terrier? It’s okay, that’s what we’re here for! The Wheaten is one of the many terrier breeds that come from the Emerald Isle, Ireland! They started out as, you guessed it, herding dogs and were a loving companion of farmers and their families for many years before coming to the US in the 1950s. While the Wheaten is still fairly rare, it’s one of our most favorite breeds in the store because they are right at home with so many families! Why not get one of our Soft Coated Wheaten Terriers for sale before they’re all gone, check them out here on our available puppies page! A little more about this teddy bear breed! The Wheaton is famous for being very people-oriented and loyal, loving to be where their family is at all times. They also have a very distinct coat that does not shed and lightens as they get older. They do require grooming regularly as their hair will continue to grow and can become matted. Most people keep their Wheatens in a “puppy cut” where the hair is just a couple inches long. They come in a few different colors, including white, cream and, of course, wheaten, which is a golden brown color. The Wheaten is an active puppy that has a lot of energy to run and play! They love children and can do well in smaller apartments or large sprawling farms! They are a medium sized dog that usually tops out around 35lbs and have an average life span of 12-15 years. This is a great breed that fits in a difficult category of light shedders, but not a small breed. Perfect for families with small children as they can be a little “rough love” with the puppy. These are just a few things about this lovable little breed, so reach out to us for more information about all the puppies we have for sale in our store today! Add a Little Spice to Your Life with a Miniature Dachshund Puppy! A Miniature Dachshund puppy is literally the cutest thing ever! Those long, little bodies and sweet little faces will win you over in a heartbeat! Miniature Dachshunds were originally bred in Germany about 300 years ago to hunt badgers. Their name literally means “badger hound”! They have also had many famous breed enthusiasts, like Picasso and Andy Warhol and were even the first official Olympic mascot. So many people recognize and love the Miniature Dachshund that they have remained an ever popular pet companion for many years. 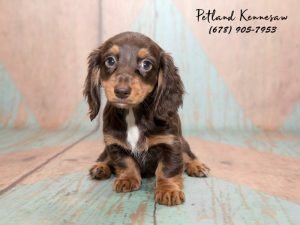 That’s why here at Petland, we always have the perfect Miniature Dachshund puppies for sale, check them out right here! Because they were originally a hunting breed, Mini Dachshunds tend to be high-spirited and independent and need regular exercise to stay fit. Despite this, they do well in smaller environments and can live happily in a condo or apartment. They do great with families with older children, but do not like to be handled too roughly. They need consistent exercise and absolutely no people food, as they tend to gain weight which puts too much strain on their long backs. Doxies come in three coats: smoth, longhaired and wirehaired. They are also considered the snowflakes of the dog world, as they come in every variety of coat color out there! They stay around 15-20lbs and have a life span of about 12-14 years. Dachshunds are very loving and loyal to their owners and become very attached to their families. We find that people tend to collect Dachshunds and will have a household full of them! Want to know more about how the Doxie might do with your family? Give our knowledgeable Pet Counselors a call today about the perfect Miniature Dachshund puppy for you!